The Pied Oyster Catcher or Eugaric bird may be seen singly, in pairs or sometimes in parties of several birds. At high tide small groups may be seen together on Long Reef Point and at low tide they feed along the rock platform. Their long red bills are strong and are able to open bivalve molluscs, especially bivalves known as Eugaries, hence the alternative common name. Their diet consists of bivalve molluscs, crustaceans and other marine animals. 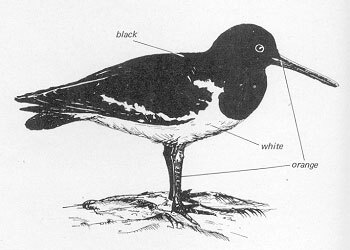 The nest is usually a shallow depression about six inches diameter scratched in seaweed in the sand, or among broken dead cor above high water mark. Two or three eggs form the clutch which are laid into the nesting hollow. The eggs are of a pale stone colour with short streaks of blackish brown.